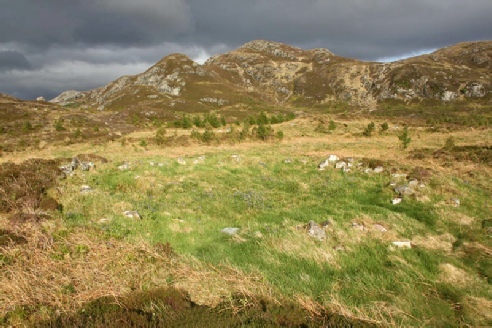 When I moved to Gairloch in 2009 I knew that there was open land behind my house and a 238-metre hill not far away: good for walking. It was going to change, because 2.5 million trees had been planted there in 2002-7, Scotland's biggest native tree plantation. I did not know if there were any paths. But gradually I discovered that there was a triangle of barely used paths within a mile of my house, one being the old road to Poolewe (1825). And there was a path most of the way up the hill (Meall na h-Eaglaise, hill of the eagle: promising! ), probably a peat-cutters' track but enlarged by the 2002-7 tree planters. The Old Road disappeared into a gorse and bracken forest before descending towards the village, and next spring with the permission of the laird (John Mackenzie) I cut a way through the gorse and cleared the bracken. 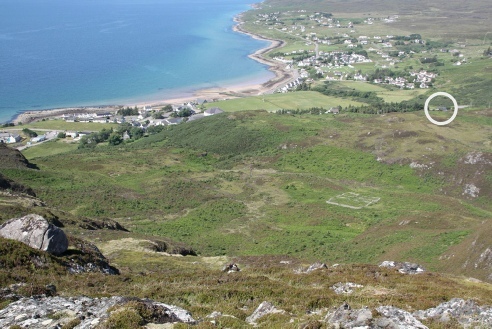 Then I advertised this path network in the Gairloch Times, and some people started to use it. One day in the Museum I noticed a map which showed six "roundhouses" in my path area. I found out that these were the remains of prehistoric houses, and was surprised that I hadn't noticed anything. But gradually over the next year I found them, and was excited to find four more. They were rough circles of stones, mostly buried by bracken or heather and some discovered only by feeling with the feet. There was one in particular which looked interesting. It was recorded on the HER website as "quite large", but I reckoned that it was enormous. It was also only 250 metres from my house, so I decided to clear the vegetation and reveal it. 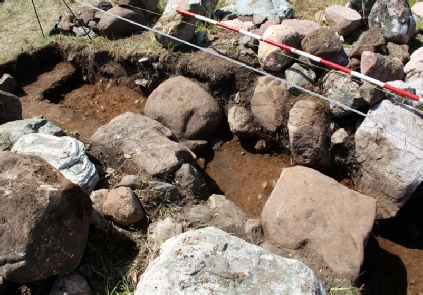 That took at least a week, and the result was a ruined wall 17.5 metres in diameter and 2 metres thick, clearly originally well built with large stones; there was also a shieling hut inside it and another outside it. It had a fine outlook to Skye, and the entrance appeared to be in the SW facing the weather: odd. 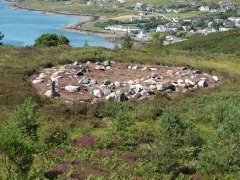 It turned out to be the biggest "roundhouse" known in Wester Ross, perhaps matched only by the one at Mellon Udrigle. 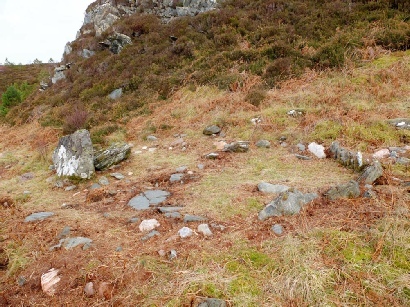 At this point I got to know Anna Welti of Ullapool, who had started a project to record and survey all the Wester Ross roundhouses; there would eventually be over 300 on her list, with about half within ten miles of Gairloch. To find out more about them, she decided in 2012 to carry out some digs: the Wee Digs Project (www.wedigs.co.uk), with funding from Heritage Lottery among others. 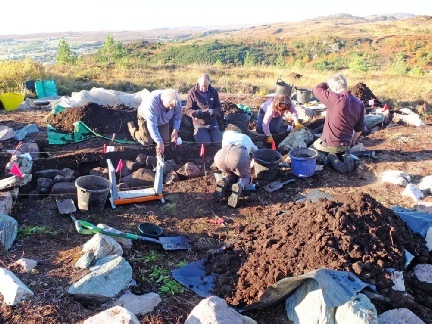 The professional archaeologist would be Martin Wildgoose from Broadford in Skye, and the digs would be based on a scheme he developed there. Meanwhile I cleared another three smaller roundhouses, one of which had had trees planted in it, and developed a second, more difficult path up the hill. And I produced the first of a series of booklets, a guide to "Achtercairn Paths" with the walks, geology, archaeology, plants and animals: a useful learning process! This is an autobiographical account, for the record, of my discovery of archaeology and the development of what is hoped will by 2019 be “Achtercairn Archaeological Trail”. Part of “Upper Achtercairn”, with my house circled. The only visible structure is a 19th century sheep enclosure. … and after complete clearance. Below, a plan of it made using a “plane table”; and an attempt to model it. The model shows a guess at how the roof was made, and an extended entrance (but…!). 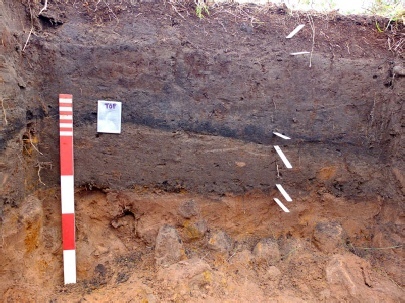 The hearth trench with fire-reddened soil. Winter solstice sunset through the entrance. 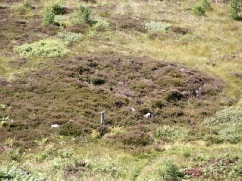 The foreground structure is a later shieling hut. The wall trench, showing its inner and outer facings. It may have been 1.5 metres high. The attempt to find a floor (the trench beyond the wall) failed. The next RH, before and after clearing. Plan, with geological colour-coding! 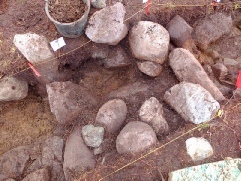 The entrance (SE, at the bottom) is complex; it may have been deliberately blocked, either when the house was abandoned, or by later farmers to make an enclosure (an unexplained later fireplace was found against the inside wall). There are four other RHs, as yet not investigated. But, with some disapproval from archaeologists, I have done a little soil clearance in each one, just enough to reveal the existence and structure of the walls. 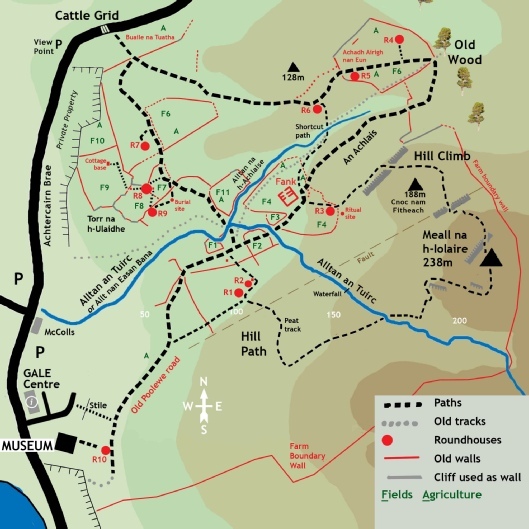 The circuit is now a self-guided trail with 28 numbered posts, starting from the new Museum or the GALE Centre (map below right). (1) It was indeed big: perhaps too big for the conical wooden roof-supporting structure to have been built? (2) The stones were massive and the wall very solidly built, implying a major communal effort. (3) The entrance was in the wrong place; it seems that almost all dwelling houses had them facing SE or thereabouts. (4) The wall trench revealed no sign of any habitation, no floor. 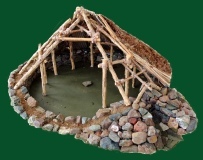 (5) The hearth did have evidence of a fire (in fact two, upper and lower), but the reddening of stones and soil implied that it had been a very hot one (too hot for a thatched roof? ), and unlike most houses there was no stone hearth. At the next winter solstice I managed to photograph the sunset from the centre of the RH: yes, it was exactly through the entrance! Carbon dating showed the fires to be from 254 and 213BC, a time when the sunset was in the same position as today. Archaeologists do not like to be definite, inserting the word "probably" or "possibly" into every sentence. 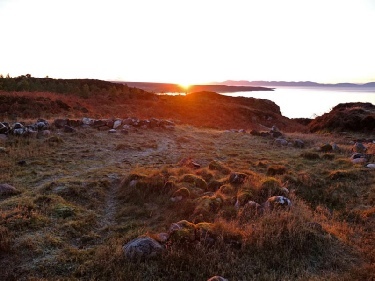 But I like to think that this circle was a kind of Wester Ross Stonehenge, built for celebrations including a midwinter fire to remind the sun to turn back north after its long run down the horizon, the bumps of the Trotternish Ridge on the Isle of Skye. And I reckon that it was the idea of some Iron Age chief with big ideas and a lot of local clout. 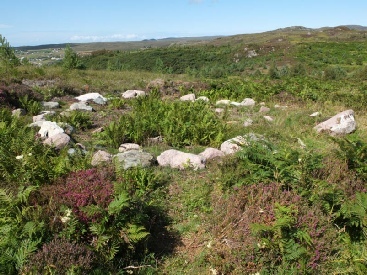 It may be a unique structure; we do not have stone circles or henges here; this is the equivalent. The crown jewel of the Achtercairn Paths! 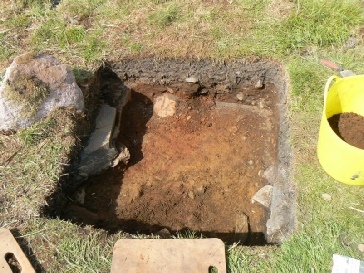 The next dig here was in one of my discoveries, a smallish RH with a fine view and a puzzling entrance: too many stones. It was another delightful occasion, with almost too many keen diggers so that we opened up a small neighbouring RH too (another of my discoveries!). The first one turned out to have started as a turf or earth walled house, on which a stone wall was later built. 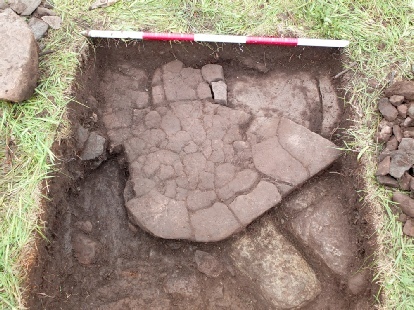 Evidence of the earlier house included a wonderful "post-hole" with a large flat-topped beach cobble acting as a "post-pad". We didn't find the hearth of this one, but charcoal from the Phase 2 hearth gave a date of 726BC, Late Bronze Age. We were finding various stone tools (but nothing metal). 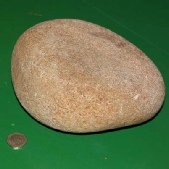 Especially common were “pot-boilers”: beach pebbles which have been heated on the fire and put in water to boil it. 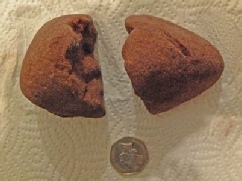 This treatment eventually cracks them in half, and these half-pebbles are easily recognisable. This was all very exciting, but the second RH, opened partly to give a school group a chance to dig, was even more special. 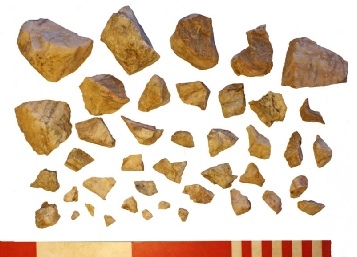 We came back to it the next year, and the final conclusion was that people had been working here in 2769BC (Late Neolithic), making a fire and chipping tools out of quartz (in an amateurish way! ); there had also been people here in 1391BC (Middle Bronze Age); and the wall had been added after that. It was never a house, and the "wall" was simply a circle of boulders; its purpose was unclear - perhaps just to demarcate a work area. Two finds: a polisher then used as a pot-boiler and cracked. This smaller RH had one trench, right across it. 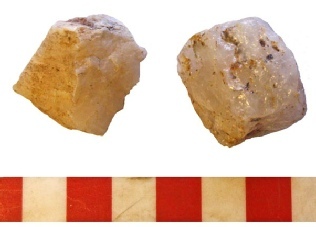 A Neolithic “quartz assemblage” of 71 pieces was found (they were scattered throughout the trench). Analysis showed most of them to be “flakes” (left), i.e. the left-overs of the chipping process. Some were “cores” (middle), the original quartz blocks. One (right) was actually a tool: a “borer” used for making holes in, for example, leather. At each dig a soil trench was dug and soil samples were taken for analysis. Standing stone and small circle: “ritual site”? 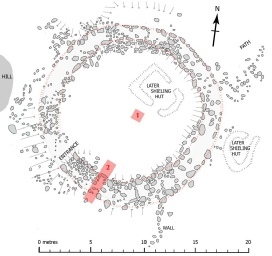 A detailed map of Upper Achtercairn and its archaeology. The digs were in R8, R1 and R2, and later in R9. For more detail, see my booklet “Above Achtercairn”. A hammer, marked on the end. 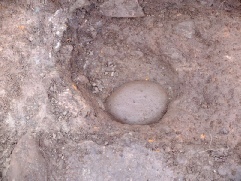 The post hole and pad. 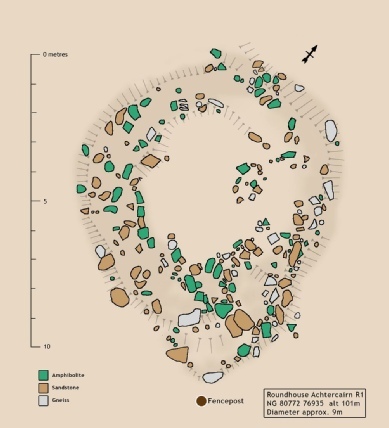 For more information on the Wee Digs project and on roundhouses in general, see the booklet “Roundhouses of Wester Ross”. 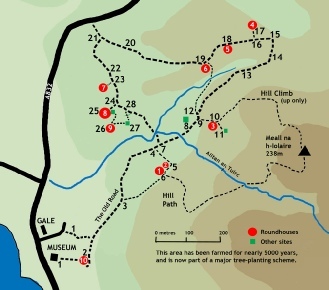 The new simplified Trail map. The trail with its numbered posts was set up in 2018, in readiness for the new Museum. A simple guide leaflet is available.